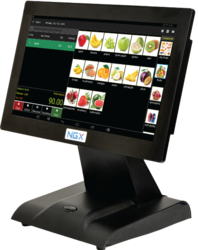 “Nunix” is an Android POS machine with 14inch LCD with Capacitive touch screen. This machine can be used for various Point of sale/billing applications. Nunix can be connected to external peripherals like Barcode, Weighing scale and Printer. NGX provides SDK to integrate with printers. Its connectivity interfaces include Bluetooth, wi-fi, Ethernet and USB. Its robust design and asthetic makes it suitable for wide range of billing application. Incorporated as a Partnership firm in the year 2012 at Surat (Gujarat, India), we “H.M Technosys are an eminent entity involved in wholesaling excellent quality range of NGX Billing Machine,Bluetooth Thermal Printer ,POS Printer Attendence Machine etc. The leggings offered by us are highly appreciated for features such as . Our mentor, “Mr. Hitesh Vekariya" (Owner), has immense experience in this industry and under his worthy guidance we have achieved a prominent position in this industry.